Configure which parser engine to use by default using site scope settings and content type scope settings. At the end of this tutorial we will not only have a useful module, we will have learned how we can wire things together with the Rules and Tokens modules and have a better understanding of how they work and can be leveraged in other modules. In this first part, we will start simple by creating the module and implementing a basic Template Management System. Implement an IMessageTemplateService that helps with quering templates. Learn how to implement import/export for custom parts that reference other content items using the ImportContentContext.GetItemFromSession method. All in all, this first part will handle nothing but basic module development except maybe for a couple of small but interesting details. For those who are just getting started with Orchard Module development, this is a probably a good intro. For those who have done this a hundred times already, you could simply download the zip file and head over to the next part, but I recommend skimming over this post to get quick glimpse of what we're doing and where we're headed. 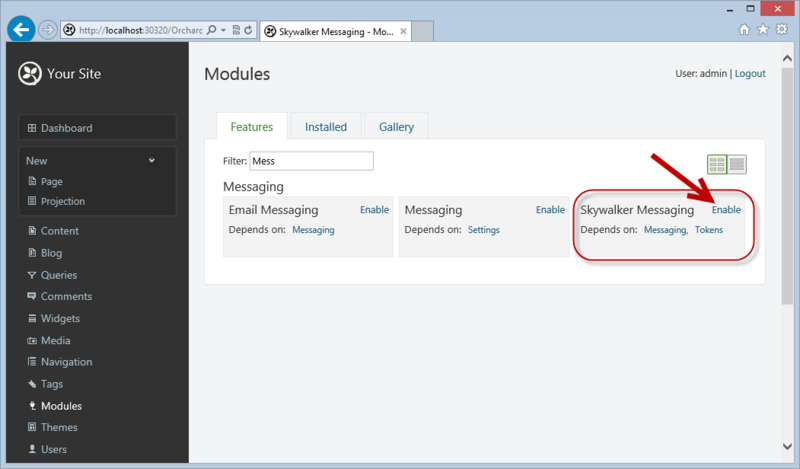 Go ahead and codegen a new module called Skywalker.Messaging. Our module's purpose is to provide message template management features. But what type of template would the user want to work with? An Email template? SMS? Or perhaps a template that can be processed by MailChimp? We can't possibly know upfront. So what we will do is provide the essentials while allowing users and developers to extend the system. Good thing we are working with Orchard, because it has just the mechanism we need: Content Parts! That's right, we'll create a content part called MessageTemplatePart, which can be used to build any template type a user wants. By default, we will include a migration that sets up an EmailTemplate content type, as such a type is probably the most commonly used one. /// Represents the essentials of a message template. /// Can be attached to any content type that needs to function as a message template. /// The title of this template. Primarily used to easily identify this template in the dashboard. /// The subject to use when sending a message using this template. Supports tokens. /// The actual template text to be processed. /// Indicates whether this template is to be used as a Layout. /// it will be used as the "Master" layout when parsing the template. As you will have noticed, we are including a property that can reference another MessageTemplatePart. The reason for this is so that we can support Master template scenarios. Ususally, when you send out emails, you will want them to have a fixed header and footer, and simply vary the content. If we didn't support the notion of a Template Layout, we would have to duplicate the header and footer in all templates, which as you can imagine would quickly become a maintenance nightmare if you have a lot of templates. Our migration will be nice and simple: it will create a table for our MessageTemplatePartRecord class and define the MessageTemplatePart. 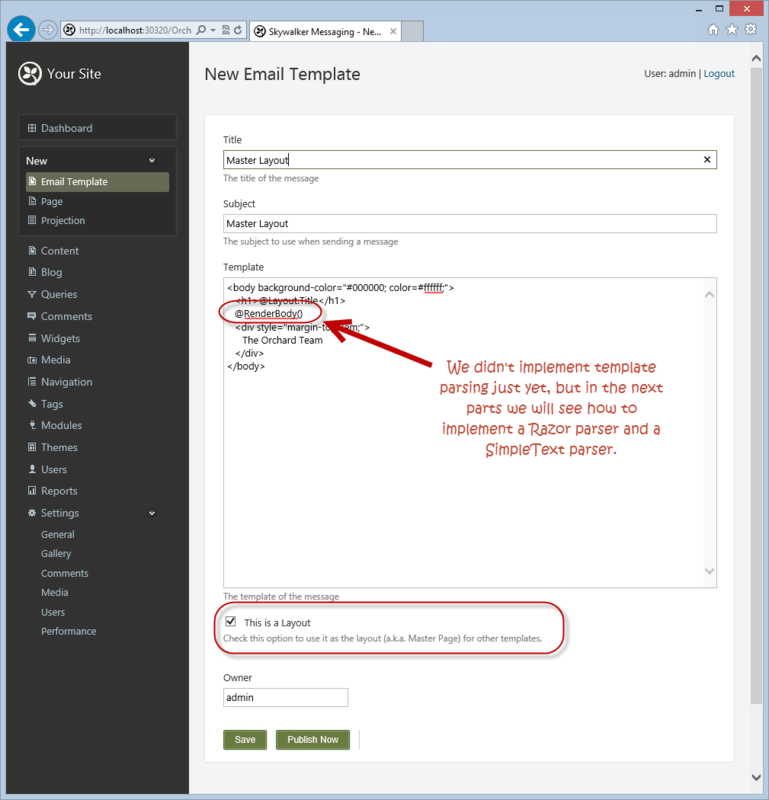 It will also define a content type called EmailTemplate that takes advantage of the MessageTemplatePart. // Define an EmailTemplate content type. Other types can be defined by the user using the dashboard and by developers to implement advanced scenarios. To provide an editor UI to our users, we will implement a driver for the MessageTemplatePart. This driver will only implement the 2 Editor methods and the Importing and Exporting methods. The Driver will take a dependency on a service called IMessageTemplateService, makes use of a class called MessageTemplateViewModel and some string extension method called TrimSafe. We'll include all that code next, so don't worry if your code doesn't compile after including the driver code. // Return the EditorTemplate shape, configured with prope values. // Here it gets interesting: "Layout" references another content item, and we can't simply serialize its Id because that may change across databases. // So instead, we leverage the content manager's GetItemMetadat method to ask for the content's Identity. // The resulting identity is built by various attached parts to the content item. // For example, the AutoroutePartHandler will contribute the DisplayAlias. // The IdentifierPartHandler will contribute a GUID. // This will of course only happen if the content item has these parts attached. // In our case, we don't require the content item to have either one attached, so we will have our own content handler contributing an identity. // We'll use this identity value in the Importing method to locate the referenced content item. // If "Layout" is specified, it will be the identoity of the referenced content item. // to the identity value we used in the Exporting method. That looks like a lot of code, but the implementation is simple: we implement both Editor methods and the Importing and Exporting methods. That would have worked out just as fine, but I it's interesting to see different approaches. As described elaborately in the comments, we are taking advantage of content identities and the GetItemFromSession method to export and import related content. The challenge with exporting and importing related content is: how to identify content. We can;t simply use their primary key values, as those will surely change from database to database. So instead, Orchard provides a mechanism to build an Identity. This is done via ContentHandlers. We'll see how to implement this later on. For now it's enough to know that we can get the Identity of any content item using the GetItemMetadata method of the content manager. Before we move on to the content handler, let's have a look at the missing pieces: MessageTemplateViewModel, IMessageTemplateService and TrimSafe. Pretty basic stuff that you would see in many a MVC application: a bunch of properties annotated with DataAnnotations. We're using the UIHintAttribute to specify a specific editor template for the LayoutId property. We'll see how that looks later on. IMessageTemplateService contains our "business logic" if you will, although be it rather simplistic: it enables us to easily retrieve templates and layouts (which are exactly the same as templates, but with its IsLayout property set to true). It also contains a method to parse a template into the final output. This takes Layouts and view engine specific constructs into account. The engine to be used will be configurable by the user. Out of the box we will provide 2 parser engines: SimpleTextParserEngine and RazorParserEngine. This service has 3 primary related responsibilities: Querying the available templates, querying the available parsers, and actually parsing a template (which will automatically select the correct parser based on the template and its settings). As we all know, an important software design principle is the Single Responsibility Principle (SRP). This basically means that all classes should ideally have no more than one responsibility. This is an important principle, but it is als important to be practical, and in this case the 3 mentioned responsibilities are in my opinion closely related enough that it would be overkill to separate them out into their own interfaces. We will implement this interface partially in this part, and complete it in the next part. The methods ParseTemplate and SelectParser will be implemented in the next part. IMessageTemplateService and its implementation MessageTemplateService reference 2 more types the we will define next: ParseTemplateContext and IParserEngine. IParserEngine is the contract that all template parsers must implement in order to be usable as a template parser. In the upcoming parts, we will be implementing a SimpleTextParserEngine and a RazorParserEngine. /// The unique ID of the parser. The default base implementation will use the FullName value of its type. /// The user friendly text of the parser. /// The default base implementation will use the Name property of its type, but is typically overridden in derived classes. /// The string / expression that will be replaced with child templates. /// For example, if a template is configured to be a Layout, it will replace its LayoutBeacon expression with the output of its child template. /// @RenderBody() in the case of a Razor engine, [Body] in the case of the SimpleTextParserEngine. /// Processes the specified template and returns the resulting string. All members should be self explanatory, except maybe the LayoutBeacon. We'll see what this is and how its used later on. It's pretty simple, you'll see. If these members strike you as eerily familiar, you're right: they are typically used in Razor views. Both members are typed as object so they are generic enough to be used in all sorts of parsers. That's it for the Driver for now. Next we will need to implement the MessageTemplatePartHandler, the editor templates and place the shapes with Placement.info. MessageTemplatePartHandler is your typical ContentHandler responsible for adding a StorageFilter to the Filters collection. We will also use it to setup the LazyField we defined in MessageTemplatePart. To learn more about LazyFields, check out http://www.skywalkersoftwaredevelopment.net/orchard-development/lazyfield-t.
We inject an IRepository of MessasgeTemplatePartRecord and construct a StorageFilter for it which we add to Filters. A filter in this context is a sort of reusable piece of ContentHandler. Orchard comes with 7 implementations of them out of the box, one of them being the StorageFilter, which get invoked when content needs to be loaded and saved. We add a pointer to a function called PropertyHandlers to a method called OnActivated of MessageTemplatePart. The OnActivated<TPart> method is invoked whenever a content item is being instantiated whose type has TPart attached (MessageTemplatePart in our case). This is the perfect place for us to do any part specific initialization, such as setting up the LayoutField lazy field. The implementation is straighforward: the loader is setup to get the template using the injected IMessageTemplateService, and the setter is setup to update the LayoutId of the part's record. In this part we will use a very simple control to render the template editor: it's called a TextArea. In the next part, we will turn this into a much better looking editor using CodeMirror and even implement a Preview pane. If you're unfamiliar with LESS and the Web Essentials 2012 extension: LESS is basically a higher level language on top of CSS, which allows nicer syntax, variables, mixins, nesting and much more. Right now we aren't using any of that, but we will use some LESS constructs in later parts. The Web Essentials 2012 extension provides us with syntax coloring, intellisense and generates both a a css and a minified css file for us, which is what we will be actually including with the output. As you will have noticed, we are using the overloaded version of Style.Include that takes two arguments: an "debug" version of a stylesheet and a "release" version of it. That means that when we set debug="false" in web.config, our application will be compiled in release mode, which will cause Orchard to automatically include the minified stylesheet. Nice! This enables us to customize the editor template being used for that specific property. In our case, we want to render a list of available Layout Templates. We already prepared that list from the driver, so all we have to do now is implement the TemplateLayoutPicker editor template. Just to be clear, this is not an Orchard specific editor template; it's just a regular MVC editor template, being leveraged by the Html.EditorFor helper method in MessageTemplate.cshtml. The template copies the Layouts passed via the ViewBag into a local variable and projects them to a list of SelectListItem objects which in turn are used by the Html.DropDownList helper method. All basic MVC stuff. Finally, we need to create a Placement.info file to specify where our editor shape is to be rendered. That's it for coding! Let's see what we've got so far. 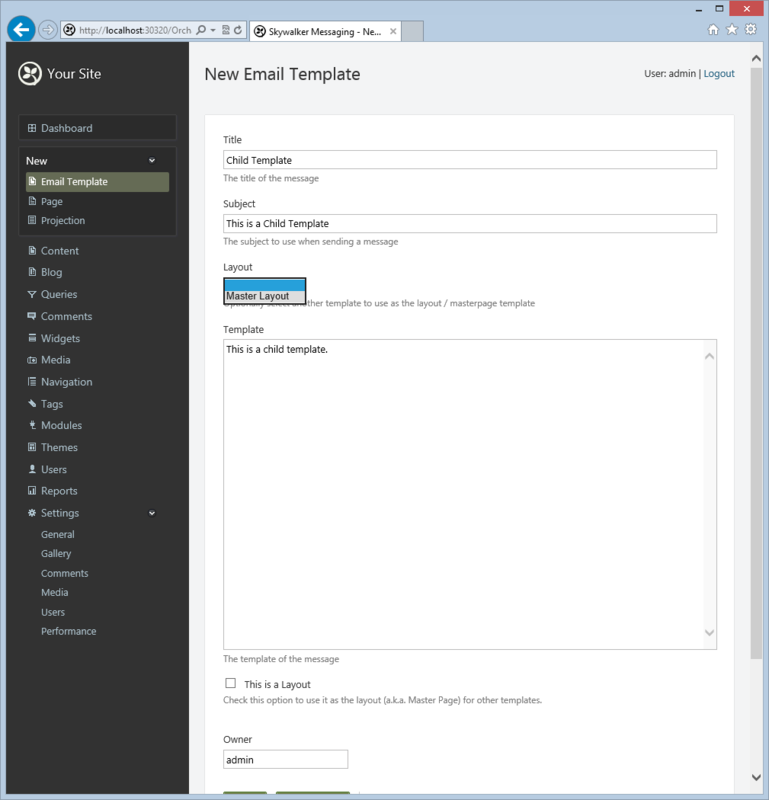 Enabling the module will create a new content type called Email Template. In this part, all we really did is setup a migration that creates a table, defines a part and a type, implemented a driver, a handler, a service and some templates. Basic stuff, for sure, but this provides us with a solid groundwork for the next parts. In the next part, we will actually implement the parsing logic and a preview pane and enhance the code editor with CodeMirror! Download the source code: Skywalker.Messaging.Part1.zip. Great Post! Thank you for share. ps skywalker can not visit.